Client: Amnon Zichroni and Co. Ltd. The wide double-sided library creates a circulation trail which penetrates deep into the space. It is possible to walk through it, around it, and beyond it. From one side of the library is an open space which holds the services wing of the office, and on the other side, a corridor is created, where along it the offices of the lawyer and meeting rooms are spread. The library, which on it's "office" side is made of cherry wood, is divided into equal cells. In the center of each cell there is fixed partitioning, which is reminiscent of a book made of wood, because of it's scale. 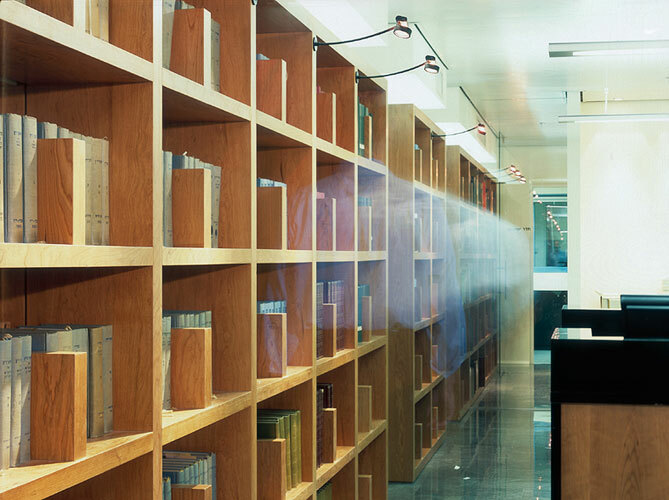 The central lighting of this part of the office arrives from the top of the library and spreads from the gap between it and the air-conditioning tunnel above it, which has the same width as the library. This way, a wall which is not a wall is created, which becomes a lighting source, creates a dominant design language, and serves the function of the office. At the end of the corridor, on one side there is a kitchenette and toilet, and on the other side of the library- a meeting room. In this area it is possible to see through the library a circular light fixture, which is hanging in the meeting room like a glowing full moon which reflects on the glass surface of the large table which is like a swimming pool. The design of the office spaces provides severity and security, whereas the urban landscape viewed from the glass screen which envelopes the office building, provides movement and steady flow to the place, day and night. As one enters the office the spatial orientation creates a sense of hospitality, accessibility and purposiveness. Whereas, opposed to most offices a reception desk, or a large waiting room do not stay the visitor. The space welcomes circulation in one of it's two main axes – right, to the services wing, or left to the wing with a symbolically heightened entrance, to the office of it's owners. The hierarchical structure is exposed here: the location, distance and even color hint on the position of each worker and enable maximum orientation.